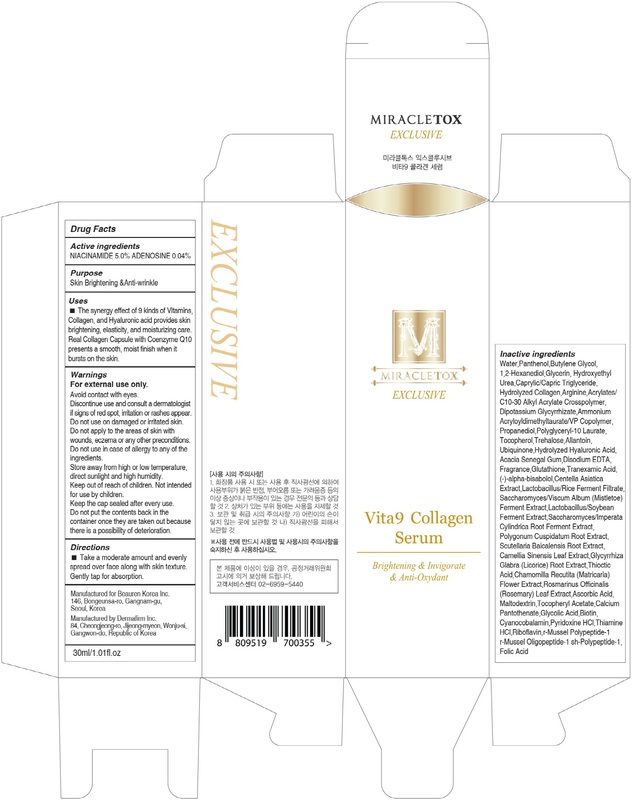 Proprietary Name: Miracletox Exclusive Vita9 Collagen Serum What is the Proprietary Name? Non-Proprietary Name: Niacinamide, Adenosine What is the Non-Proprietary Name? 71619 - Beauren Korea Inc.
Miracletox Exclusive Vita9 Collagen Serum with NDC 71619-220 is a a human over the counter drug product labeled by Beauren Korea Inc.. The generic name of Miracletox Exclusive Vita9 Collagen Serum is niacinamide, adenosine. The product's dosage form is liquid and is administered via topical form. Labeler Name: Beauren Korea Inc. Warnings:For external use onlyAvoid contact with eyes.Discontinue use and consult a dermatologist if signs of red spot, irritation or rashes appear.Do not use on damaged or irritated skin. Do not apply to the areas of skin with wounds, eczema or any other preconditions.Do not use in case of allergy to any of the ingredients.Store away from high or low temperature, direct sunlight and high humidity. Keep out of reach of children. Not intended for use by children.Keep the cap sealed after every use. Do not put the contents back in the container once they are taken out because there is a possibility of deterioration. Uses:■ The synergy effect of 9 kinds of Vitamins, Collagen, and Hyaluronic acid provides skin brightening, elasticity, and moisturizing care. Real Collagen Capsule with Coenzyme Q10 presents a smooth, moist finish when it bursts on the skin. Directions:■ Take a moderate amount and evenly spread over face along with skin texture. Gently tap for absorption.